The Presidio Is the Most Underrated Part of SF. Go There Right Now. No, dude, it wasn't; there wasn’t even a stoplight visible. But while 4/20 may be a special occasion -- one in which made-up stoplights can be given a tolerant pass -- that claustrophobic feeling of mass overcrowding can crawl down your neck any warm weekend in the park. There are just too many people there... it's hard to enjoy an open lawn when you and your fellow picnickers are packed so tight that you have to physically sprawl across a small patch of grass if you want to claim it. I bailed early and cut over to the Presidio. All of a sudden, it was as if I was in a different city entirely. The roads were empty; the views were stunning as always, with the sun setting over the ocean; and the quiet calm in the trees, reaching over the water below, felt less like a city park than a tiny patch of wild, right here in San Francisco. 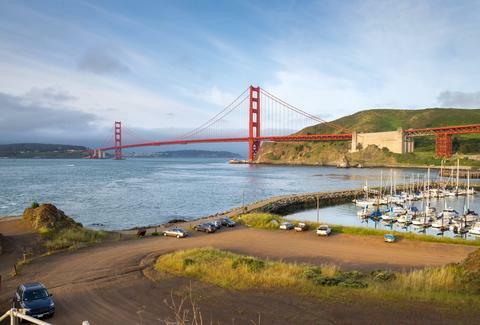 So this summer, while everyone else flocks to Golden Gate Park, you could do something crazy: head to the Presidio instead. Every year, 13 million people visit Golden Gate Park -- and most of those people come during the four months we're in right now. That's a lot of people to cram into 1,000 acres, and it feels like a lot of people. There's nothing wrong with the park, with its gardens and bike paths and meadows, but it is definitely not a place you go to escape it all. You know how many people visit the Presidio annually? About 5 million. And let's be honest: the vast majority of them never leave Crissy Field. 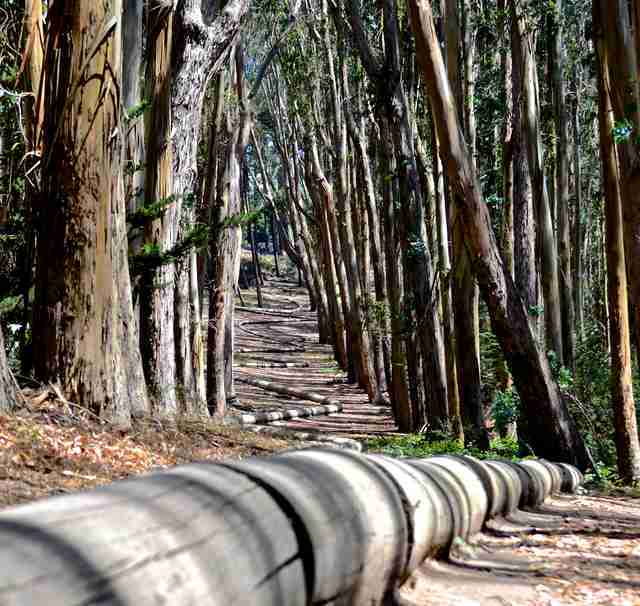 That leaves most of the Presidio's 1,500 acres blissfully untouched. Once you get away from the bridge, you'll find miles of soft trails through sun-dappled trees in the southern section of the park, and scenic overlooks hanging off dramatic cliff sides along the water. Also, 991 acres of the Presidio are straight-up preserved as open space: that's an insanely large slice of land, especially for a park that's right in the city. And it's equally crazy that so few of us take advantage of it. We tend to feel like the Presidio is this remote thing just for tourists, or hard to get to... so instead, we drive hours to go on a hike. But you can hike here too -- and it is literally only a quick bus ride away. Culturally, it does make some amount of sense that we might overlook the Presidio. It was only given to the National Park Service in 1994, after all -- for centuries, it was a military base for Spain, Mexico, and then the US. Before that, the Ohlone people lived there. It was even once offered as the possible site for the UN headquarters, which ultimately went to New York instead. Their loss. All of that history is part of what makes The Presidio such an interesting place, and why it's a National Historic Landmark. You know what Golden Gate Park was before it was a park? Nothing. As part of the deal to take over the military base, the Presidio Trust, which runs operations in the park, has rehabbed hundreds of historic buildings. I'm not exactly suggesting you take the historic walking or audio tours, but if you'd just like to see weird, old buildings, then all you need to do is head over there and look around. The Main Post is surrounded by its original buildings, now full of nonprofits and small business, and the great lawn there hosts Off the Grid food trucks during the summer on Thursday nights and Sunday afternoons. In fact, you can eat really, really well there everyday. The old-school Presidio Officers' Club now has a Mexican restaurant, Arguello, inside, where you can sip excellent margaritas and revel in just how much history you must be learning through osmosis. Presidio Social Club should be on your regular brunch rotation, Sessions has you covered for beer, and The Commissary is one of the best restaurants in the city. You can even stay at the Inn at the Presidio for a super-classy staycation. There's actually 2,700 San Francisco residents who live inside former army barracks and converted base buildings. I don't know if that's relevant, but I just think it's really baller, and I have a secret squad goal to live in one of those swank officers' houses off Lincoln. Look, I know it can be confusing. It's not a simple rectangle, like our more well-known parks, and almost all of the locations in the Presidio refuse to use real addresses. Where is the China Brotsky Gallery? Well, it's sort of in the old army hospital, down a hallway? But all of these details just add to the mystique. Sure, that means every time I want to go somewhere new, I have to figure out which gate to enter, and which one-way street to take... but remember The Secret Garden? Anything that needs a literal wall and gates has to be good. And once you're inside, there's simply so much variety. You can go bowling. You can play golf. And because it's a former army base, there are gyms and pools and what used to be a hospital. I'm not saying a cemetery is everyone's cup of super-fun-times tea, but it's got one of those too. It’s easiest to think of The Presidio in sections: over by Crissy Field, there's a nicely rehabilitated wildlife habitat, with lots of big white birds and cute quail, and a few remodeled buildings that house a trampoline gym, a rock-climbing facility, and a bike rental places. Then there's the Main Post (and the Letterman buildings), which have businesses and museums and yoga studios and all kinds of historic stuff, like the Presidio chapel. 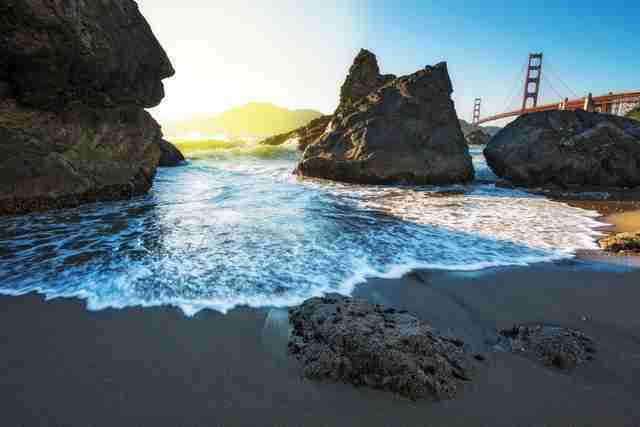 Along the Pacific Ocean, in the Baker Beach coastal area, you'll want to walk the Coastal Trail and take pictures over the bluffs. But it's the Southern Wilds that's probably my favorite part, because it's so often the most ignored. This is where the fog rolls in along empty trails that wind through tall cypress trees. You can literally camp here right here in the wild, or you can just get lost in the eucalyptus groves on a short walk after work. And you probably will get lost. I can almost guarantee this inevitability. Maybe you'll wander down the creek, past a baseball diamond where soldiers used to play, through the forests behind the barracks, where coyotes run, and you'll come upon the ruins of the century-old batteries. And you'll look out past them, over the city's edge, into the Pacific Ocean, and think: this is so much better than never having the chance to get lost at all.